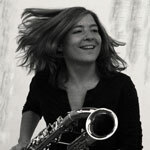 Born in 1978 in Budapest, Andrea Nagy began her studies with András Horn at the Béla Bartók Conservatory (Budapest), then with Béla Kovács at the Franz Liszt Academy of Music. She went on to the Hochschule für Musik in Freiburg (Germany) where she studied with Dieter Klöcker and Jörg Widmann; in 2003, she obtained her master degree. She then pursued the soloist programme under Ernesto Molinari at the Bern University of the Arts. For the performance of her final examination in 2006, she was awarded the Eduard Tschumi Music Prize of Bern as the “best soloist” of her year. In order to study bass clarinet, she continued two more years at the Bern University of the Arts. Andrea Nagy has won several prizes: 1st prize at the Hungarian National Music Competition in 1993, a scholarship to join the prestigious International Summer Course for New Music Darmstadt in 2002, the Kranichstein Music Prize of the City of Darmstadt in 2004 and 1st at the Nicati Performers’ Competition for Contemporary Music organized by the Swiss Tonkünstlerverein (Musicians’ Association) in 2009. She has taken part in master classes given by prestigious professors such as David Smeyers and Eduard Brunner, as well as participating several times in the International Summer Course for New Music Darmstadt. She has also worked with Stefan Litwin and Yukiko Sugawara. With various chamber music ensembles, Andrea Nagy has taken part at the following festivals: Festival of Mecklenburg-Vorpommen, Festival Music Today in Seoul and the Lucerne Festival. She has participated in many recordings and also appeared on radio and TV, performing the music programme “Nachtmusik” for the German TV channel WDR 3 or as the subject of a feature for the “Musik Debüt” series on the channel SWR. Andrea Nagy performs regularly with ensembles such as the Klangforum of Vienna, Ensemble Modern, Ensemble SurPlus and the Esbjerg Ensemble of Denmark, and has worked with renowned conductors and composers such as Heinz Holliger, Pierre Boulez, Matthias Spahlinger, Erhard Karkoschka, Cornelius Schwehr, Lucas Vis, Nicolaus A. Huber, Helmut Lachenmann, Markus Stenz, Johannes Kalitzke and Sylvain Cambreling.